Looking to apply for a working holiday visa for Canada? The International Experience Canada program is what you need. It is the easiest way for young people to live and work in Canada temporarily. This guide is intended to help applicants prepare and apply for the IEC, specifically the working holiday stream. 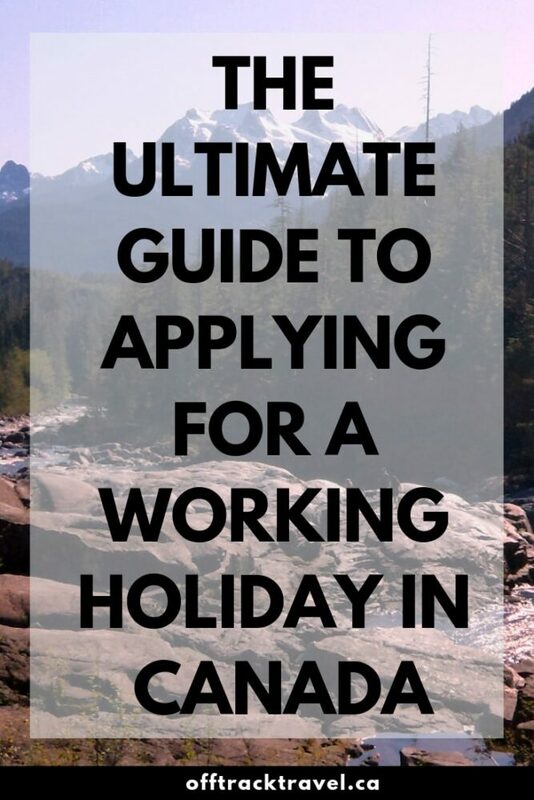 It explains everything you need to know about acquiring a working holiday visa for Canada. If you want to read just one article about the IEC application process and be confident about applying yourself, this is it! I have been writing application guides for the IEC for almost 7 years. This article is regularly updated to reflect changes in the IEC application process. This post includes affiliate links. If you buy a qualifying product through these links, I may receive a small percentage at no extra cost to you. What is the IEC program? How much does a working holiday visa for Canada cost? Communication – Who Can I contact? International Experience Canada (IEC) is Canada’s youth mobility scheme. Within it, there are three programs – Working Holiday, Young Professionals and International Co-Op. Participating IEC countries have at least one of these programs available, with some countries having more than one. The most popular IEC stream is the working holiday program. The length of the included work permit varies from country to country – check this bilateral agreement to check yours. Participation in the working holiday program is usually a one-time deal unless you have dual citizenship. So the moral of this story is: use it or lose it! Each participating IEC country has an annual quota of places based on reciprocal agreements with Canada. Demand outstrips the quota in certain countries for the working holiday programs. France, South Korea and the UK are just some examples where demand is high. The following are the total costs for a working holiday visa for Canada (in Canadian dollars). Please note that none of these fees need to be paid until you have received and accepted an invite to the working holiday program. The IEC application process was completely re-worked in November 2015. Prior to this, the process was first come, first serve. IEC working holiday applicants must first complete the ‘Come to Canada’ questionnaire to check their eligibility for the IEC program. Eligible candidates then create a profile (with identity details, citizenship, current residence etc) which is put in a pool for the category they wish to participate. CIC will regularly invite candidates from each pool to participate in the program throughout the next year unless the quota runs out sooner. It is a random selection. An invite may take a week, a month, six months to arrive, or in the case of countries with more demand than places (such as the UK) not at all. Once an invite is received, the applicant has to decide whether to accept or decline within 10 days. After the invite has been accepted, applicants will then need to apply for a work permit submitting completed forms, documents (such as police certificates) and payment within 20 days. Up to 8 weeks after submitting the work permit application, a decision will be made. The IEC working holiday program runs in year-long ‘seasons’, generally running from autumn to autumn. The opening date of the 2019 pools was 4th December 2018, with the first invite round for some countries on 27th Dec. If you’d like to be alerted of updates, sign up for my IEC newsletter (includes a free packing list on sign up!) or join the O Canada IEC Facebook group. Read on for a step by step guide to the IEC working holiday application process. Entering the rest of your personal information is straightforward from here. If eligible, you should see a confirmation of eligibility for the IEC working holiday program and then a reference code (e.g. JM1234567890). There will also be a link lower on the page to MyCIC, the next step of the process. To create and submit an IEC profile for a working holiday visa in Canada, you will first need a MyCIC account. If you already have MyCIC account from a previous application, you can use it for this IEC application too. If you do not have a MyCiC account, you will need to use the ‘Continue to GCKey’ link to open one. Once signed up/logged in, select ‘International Experience Canada’ under the ‘what would you like to do today’ title. On the next screen, you will need to enter that personal reference code you got at the end of the Come to Canada questionnaire. Entering the correct code will take you to the e-service application. On the e-service application, there are four categories of information to validate and submit. Some information that you supplied in the Come to Canada questionnaire has already been entered automatically for you. Only basic contact and personal details are required for this section, along with information from your passport. Each section must be validated and then saved. Once each section is complete, you can submit your profile into the pool. The profile must be submitted within 60 days of starting it. Once entered, the profile will remain in the pool for a year. Submitting your profile is free and you do not have to accept a place and continue on in the process if invited. Helpful tip – Even if you have a job lined up for your working holiday (not required), DO NOT indicate that you have. This complicates things later as extra documentation from your employer will be requested. All eligible applicants in each IEC pool have an equal chance of being picked randomly. This does, however, mean that if you are applying for a program that has high demand, there is sadly no guarantee you will receive an invite to the Canada working holiday program. While waiting, consider what police certificate(s) you may need to apply for and whether you need to perform a medical exam. Police certificate(s) – these are required from any country or territory that you have spent six months or more since the age of 18. This six month period is not cumulative (doesn’t accumulate), so even if you live in another country (other than your home country) for four months every year, you still wouldn’t need a police certificate for that country unless asked. Updated 2018. Medical – an exam is required if you have lived/travelled in certain countries for six months or more OR if you plan to work closely with children or in health-related services in Canada. The exam must be performed by an approved Panel Physician. If you do not complete a medical before arriving for Canada working holiday, your IEC work permit will state that you are unable to work in these sectors. If you are randomly selected, an invite to apply for a work permit will be sent to your MyCIC inbox. Applicants have 10 days to decide whether to accept or decline the invite. Clicking ‘Start Application’ accepts the invite, waiving whatever is left of the 10 day period. As soon as the application is ‘started,’ the next stage begins. If you have multiple/complex police certificates to apply for and/or a medical (or just need more time in general) consider holding off clicking the ‘Start application’ button for 7-8 days. Whatever you do, do not wait until the 9th or 10th day! Technical issues sometimes cause the CIC website to fail. After accepting your IEC invite, you will 20 days to complete a work permit application via MyCIC. First, you must submit more information regarding your work/education history, citizenship info, communication details (email address, phone numbers etc). A fair amount of this info is pre-loaded from stage one (profile) and is not possible to change. Your answers to the work permit application questions will determine a list of required documents that also need to be uploaded. MyCIC will guide you through the process to download/complete/upload the forms and complete payment. Police Certificate (multiple) – don’t worry if you only have one! Major update to the Canada working holiday application process: IEC applicants now have to visit a Visa Application Centre (VAC) and submit biometrics (fingerprints and photo) after submitting their work permit application. More details below. There is an optional ‘Letter of Explanation’ slot which is useful if you need to provide any extra information about your application. If you are having trouble submitting your application without a Letter of Explanation, upload a document in this section and then delete it. You should now be able to submit your work permit application. Important! If you do not have the required documents within the time you need to submit them (police checks, medical proof if applicable) you should upload a ‘Letter of Explanation’ (self-created) to explain why. You will then be given a time extension for this section of the application. If you do not upload any receipts/appointment proof/Letter of Explanation and the 20 days runs out, your application will be cancelled and you will have to wait for an invite again. New for the IEC application in the 2019 cycle is the requirement to submit biometrics – a photo and fingerprints. These biometrics can only be submitted at Visa Application Centres (VAC) and Application Support Centres (ASCs, USA only). After submitting your work permit application, you’ll be sent a request to submit biometrics, usually within 24 hours. You must submit your biometrics within 30 days. Currently, there are no VACs in Canada where IEC applicants can give biometrics – if you’re already in Canada, you’ll need to head to one of the American VACs or ASCs. Submitting biometrics costs $85. Applicants also have to make their own way at their own expense to the nearest VAC. IEC applicants from Europe and Asia have been required to submit biometrics since 31st July 2018. From 31st Dec 2018, IEC applicants from Asia, Asia Pacific and the Americas will also need to do so. This information is subject to change as more details and experience of the biometrics stage of the IEC application is known. Once your biometrics have been submitted, you should receive an assessment within 56 days (8 weeks). If not, follow your application up with the IRCC web form. If successful with your IEC working holiday application, you will find a ‘Correspondence Letter’ in your MyCIC inbox. This is your Port of Entry Letter of Introduction (referred to as a POE or LOI). Here is a POE letter example for the Canada working holiday program. Congratulations! Be sure to print and save your IEC POE Letter, so you have both electronic and paper copies. With your POE approved, you can now move to Canada anytime within the next calendar year. I would not recommend waiting until just before expiry to activate in case of flight or other travel delays. When issued your work permit, triple check all details before leaving immigration. If there are any issues, it is much more difficult to fix after leaving the airport or border. In particular, be sure to check the expiry date and work location (it should read ‘open’). Long stay travel insurance policies can be hard to find. Check True Traveller (EU citizens including Brits), Fast Cover (Australians), Down Under (Kiwis) and World Nomads (over 100+ nationalities). Click to read more about working holiday visa Canada insurance options. After six years of helping others with the working holiday visa application process, I’ve picked up a few bits of crucial advice that may be helpful along the way. Be sure to fill in all form fields when completing the IEC application. If a question does not relate to you, enter ‘n/a’ or ‘not applicable.’ This is especially relevant with regards to the intended work/employment questions. Canada’s working holiday program offers an open work permit, so do not enter any job details in these fields, even if you do happen to have something arranged. Some countries have a residency requirement e.g. Sweden, the Netherlands. If you are from one of these countries it is mandatory to list a mailing address in your home country to be eligible for the IEC. Always answer as truthfully and completely as you can. If there is not enough space in a field to you to fully answer the question, upload an additional Word document with more information under the ‘Letter of Explanation’ section. Don’t leave time gaps in the resume. The resume is NOT designed to be used in Canada to look for work, it is a document required by IRCC to understand your movements (employment, education, travel) prior to the application. The immigration team are not evaluating work/education skills, but are looking for gaps in the resume that may suggest travelling/working in other countries (and hence a police certificate may be required). If you leave gaps, it is very possible IRCC may request more information and this will delay your application. If you have more than one document for a category (i.e. two police certificates) combine documents into a multi-page PDF using an online converter. As per a recent update from IRCC, when submitting the Family Form, you must print, sign, scan and then upload. The question ‘What is your current country/territory of residence?‘ refers to where you physically are at the time of application. If this has changed since you completed your IEC profile, add a Letter of Explanation in your application and explain where you currently are. Keep in mind that CIC may contact you and request more documentation, depending on your circumstances. This does not necessarily mean you will not get your IEC work permit, but it will prolong the process. Police certificates are required from each country or territory where you have lived for six months or more. The certificate(s) must be no more than 12 months old unless they are from a country you no longer live in and not returned to. If not in English or French, the certificate must be translated. IRCC have confirmed that this six month period is NO LONGER cumulative, meaning that you could live in another country for four months every year but would not need to provide a police cert from that country unless asked). It is generally easier to complete a medical before entering Canada. It is possible to do a medical in Canada after you have arrived but you will have to go to a border to have your work permit details changed after the medical has been processed. This loses you time on your work permit and may cost extra money. Before submitting your IEC work permit application, make sure you have uploaded each document in the right category. Don’t leave it until the last minute to submit. Although you have 20 days to submit the documents, do not wait to submit until the 20th day. Anything can happen – computer failure, server issues…both at your end and with CIC. Don’t risk it! If you don’t have a document (e.g. police certificate) by the time you need to upload it, submit the details in a ‘Letter of Explanation’ in this slot instead. Once you have your POE, print it at least once and then save it onto your computer and keep a backup via the cloud/email/USB storage. Don’t let your only copy of your all-important POE be an online version. You never know when websites are going to be down for maintenance or have other technical issues! If you have a burning question about applying for a working holiday visa Canada, you’ll probably find the answer below. Before the pools to open for each cycle, is there anything I can do to get my application started? It is best to just wait until the pools are open. Once the pools do open, it is not necessary to rush. 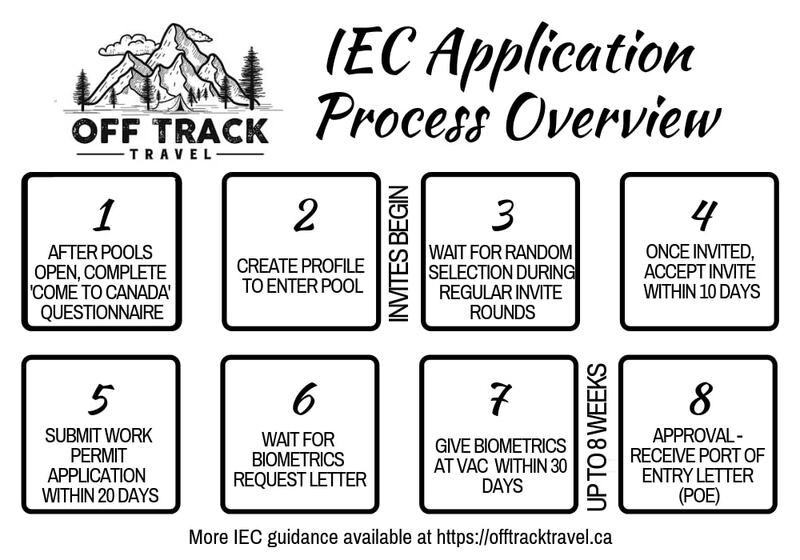 Since the IEC no longer runs on a first come, first serve system, there is no benefit to submitting an application on the day the pools open. Invites do not usually start for another two to three weeks afterwards. Take your time and make sure all details are correct before submitting your IEC profile. My passport runs out mid-2019. Will this be a problem when applying for the IEC working holiday program? For the working holiday visa program in Canada, your passport must be valid at the time of application. Once you have your POE, I would recommend getting a new passport before you go to Canada. I turn 31/36 soon, how does this affect my application? To be eligible, you must submit your profile to the pool(s) before turning 31 (36 for some countries) AND get picked from the pool before turning 31/36. I am a British citizen and do not seem to be eligible to take part in the working holiday program? The most common issue to come up for British applicants is having trouble passing the initial ‘Come to Canada’ questionnaire. The solution for most people – make sure ‘British Citizen’ is selected instead of ‘United Kingdom & Colonies’ for country/territory of passport. When should I apply for a police certificate? For IEC program, police certificates must be dated within the last year (confirmed by the IEC social media team). Police certificates can be older than this if from a country that you have not returned to since receiving the certificate. It is my opinion that it is not worth applying for police certificates in advance unless you are from a country which has low demand or unlimited places. There isn’t really a major advantage to getting police certificates in advance unless they are from a country where it is complex to apply e.g. the USA. Can I apply for the IEC program from within Canada? Yes, you can apply for the IEC where ever you are in the world as long as your country’s requirements do not ask for current residency i.e. Italy. For Australia, Ireland and the UK (and most other IEC countries), there is no problem applying from within Canada. However! If you were considering going to Canada to wait out the rest of the application after submitting a profile to the pool, I would not recommend this unless you are from a country with an unlimited quota (e.g. Australia). 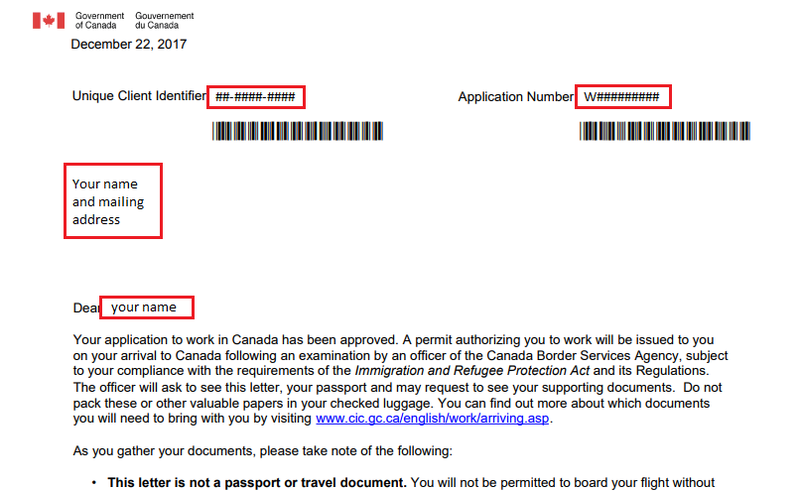 When I receive final approval (POE), how long do I have to enter Canada? You will have one year to enter Canada and then another year (or two, depending on the participating country) to live and work in Canada. Example – I am a British citizen, eligible for a two-year IEC working holiday permit. I receive my POE letter in April 2019. I have until April 2020 to enter Canada. I decide to move to Canada on 10th November 2019. I will be given a permit valid for work and travel until 9th November 2021. What is an ETA, do I need one? Canada has an Electronic Travel Authorization program. This means that every visitor arriving by air needs approval before boarding their flight to Canada. All IEC approvals after August 1, 2015, are issued with an ETA automatically (check page 2 of your POE letter). Applicants do not need to apply for one separately unless they change their passport after application. I am from a country that has more than one IEC program. Can I apply for more than one? Yes! As per this CIC FAQ, dual citizens can take part in the IEC with each citizenship. Is there a template for the resume/CV? 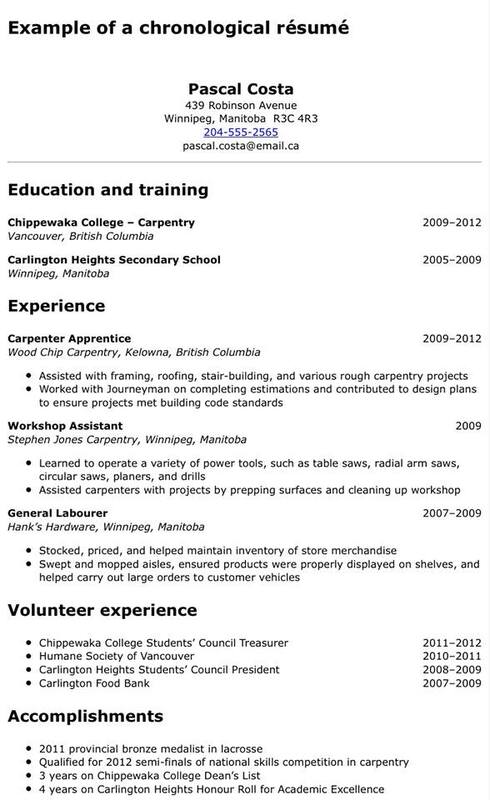 There is no longer an example provided but here is an older IEC resume sample. The most important thing to remember about the IEC working holiday application resume is that it is not the same as a work resume. It is a factual timeline of your work, travel and educational history. I have been asked for a Court Record/police report, why is this? If you’ve been asked for this document, you answered ‘yes’ to the “Have you ever committed, been arrested for, been charged with…..” question. You will need to get details of your arrest/offence and submit this. If you’re from the UK, you can apply for a Subject Access Report. I would also suggest attaching a Letter of Explanation with more details of your offence and how you have been rehabilitated since then. I have just received an email which says something has changed in my IEC application, but there is no update. What is going on? These are referred to as ‘ghost emails’ – think of them as a false alarm. Most Canada working holiday applicants get a couple during their application, but it is perfectly normal to not receive any either. 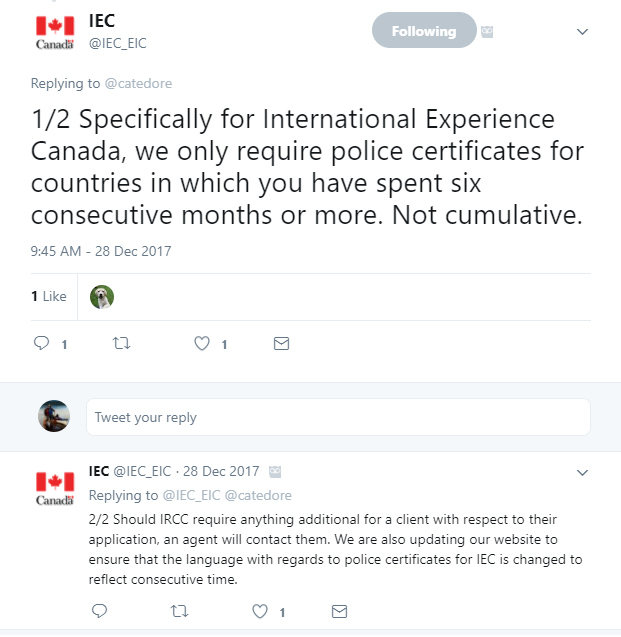 I am currently in Canada or have lived in Canada before – do I need a Canadian police certificate for my IEC working Holiday Application? Not unless specifically asked by CIC. Should I use BUNAC/SWAP/other working holiday company to help with my application? If you are from an IEC participating country, I would highly recommend applying independently of any company. It may be your first time travelling or living abroad, but there is a lot of information already available about working holidays online plus a range of different forum websites (including Facebook) on which you can gather advice and possibly meet others in the same situation. Another thing to keep in mind is that when you apply to the IEC yourself, your first priority is your own application. Allowing a business to apply on your behalf gives the control away to someone else and you will NOT be their first priority. My advice would be to keep your own IEC destiny in your own hands! Do I need proof of insurance when I apply for a working holiday in Canada? No. You only need proof of your working holiday travel insurance on arrival in Canada. I have been refused because I did not include an address in the country of my citizenship in my application. What’s the deal with this? The eligibility criteria for some countries require applicants to have a permanent address in the country of their citizenship. Be sure to check the requirements for your own country. I’ve lived in Queensland or Victoria (Australia) for over 6 months. CIC says I need a traffic report or driving history? Even if you did not drive in these Australian states or hold an Australian license while living there, you still need a traffic report/driving history to complete the police certificate requirements. Contact the transportation authority in Queensland and/or Victoria and explain your situation. Both authorities accept email enquiries. If you did not have a license while visiting or living there, explain that you need a letter stating you did not hold a license. Provide all relevant details (visit dates, addresses etc). You should receive an official letter back which you can upload to MyCIC. I said I already had a job in Canada in the first stage. now it says I must provide information including an employer number for this job. How do I submit my working holiday Application for Canada? As per this CIC FAQ, fill out the fields with obviously fake numbers e.g. 99999999 and/or write “Not Applicable – Working Holiday” where possible. The IEC Working Holiday program offers an open work permit so employer details are not required. Help! My Letter of Introduction (POE) is blank?! You are probably opening the PDF on a mobile device – try opening the document on a computer. Or better still, save the file onto your desktop and then open it. I have previously lived in Canada. CIC have now requested a RCMP Criminal Record Check. How do I get this? A minority of applicants may be asked for an RCMP Criminal Record Check due to previous residency in Canada. Do not apply for this unless you have been specifically requested for one. The request may come even if you have already received your LoI/POE. If you are in Canada, this is reasonably straightforward to get. Visit your local RCMP station for more info. If you are outside Canada it is much more difficult and involves sending either a postal application (which takes a LONG time) or submitting an electronic application through a third party company. My friend Joe from morehawes has been through this himself (in fact, this advice is all his) and initially had his prints done at a local police station in the UK. They were rejected. He ended up going to New Scotland Yard in London and paying a high fee to get them done, but these were actually accepted. The staff at NSY are practised at doing fingerprints the old way (ink), while at smaller police stations it is a rare thing to do. You can usually request an extension if you are having trouble getting the Police Check done by a certain timeframe. I did not submit my IEC work permit application within the required 20 days. What happens now? I’m afraid you have missed your opportunity to get your POE and will receive a refund for fees paid. You will need to apply again for the IEC and hopefully receive another invite. How do I transfer money to Canada on a working holiday? The method with the best exchange rate and least fees is to use an online money transfer service like Transferwise and CurrencyFair (this link offers one free transfer). What kind of travel insurance do I need to buy? Travel insurance for a working holiday in Canada must cover repatriation, medical expenses and be the length of your intended work permit. Otherwise, you risk having a shortened permit with no option of extension. Two-year travel insurance policies are not common. Check True Traveller (EU citizens), Fast Cover (Australians), Down Under (Kiwis) and World Nomads (over 100+ nationalities). Is it possible to extend my working holiday visa? Only in very specific situations. These specific situations include correcting expiry date mistakes made by border officers. It is NOT possible to extend outside of these situations. If you want to stay longer in Canada, consider either Permanent Residency or a sponsored work permit. As a government organisation, IRCC (Immigration, Refugees and Citizenship Canada, also called CIC) is notoriously hard to get in touch with. There is a Canadian call centre but to be honest, like many call centres, they simply repeat information from the website. They cannot really offer much in the way of advice and updates on your individual application. If you’re looking for advice on applying for the program the best resource is the IRCC website and the Applying for a Work Permit Outside of Canada guide (step five). Other than that, Facebook groups are a great resource for advice from others who are currently applying or have done before. 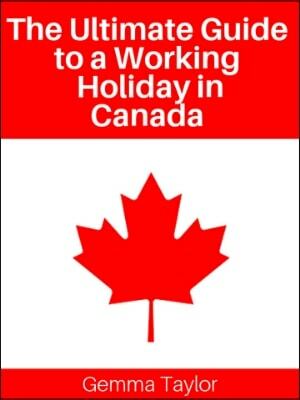 For more advice and tips about the IEC working holiday program, check out my ‘Ultimate Guide to a Working Holiday in Canada’ eBook. 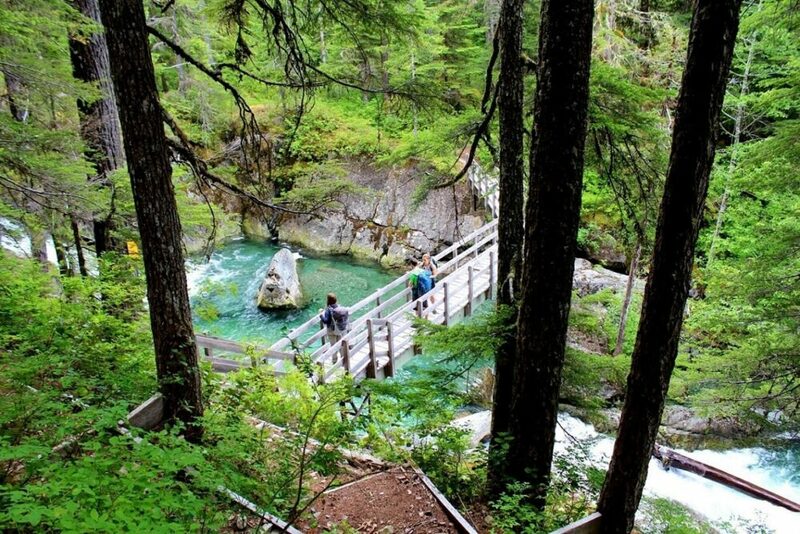 It contains everything you need to know about going on a working holiday to Canada! Any questions? Leave a comment or check out my O Canada IEC Discussion & Support Facebook group! About me: I have been helping people with the IEC process since 2012. I originally moved to Canada on the IEC program in 2011, became a Permanent Resident in 2014 and finally a Canadian citizen in 2018. Please note: I do not work (or have not ever worked) for IRCC/CIC. I am not an immigration lawyer or consultant. The information here has been gathered from personal experience/online research of the IEC working holiday program as well as second-hand information from previous applicants. If you follow the advice above and in the comments below, you are doing so on the understanding that is peer-to-peer advice. I cannot be held liable for you, an applicant, experiencing any problems (including a refusal) with your IEC application. Secondly, be aware that I refer to ‘working holiday visas’ in this article but what IEC actually offers is an open work permit. Most participating countries are part of the visa waiver program and hence citizens from these countries do not need a visa to enter Canada. If you found this post helpful, PIN or save it for future reference with one of the images above! Thanks for the guide! I have a question. My boyfriend and I want to apply, but he is British and I’m Dutch, so we’ll be in different pools. But say when he doesn’t get an invite and I did and accepted it, can I still cancel and apply again the year after, or would I then have used up my chance? I have a stressful situation whereby I actually had an IEC POE letter, soon after receiving last year my mum was diagnosed with cancer and passed away within 5 months. Obviously this meant that my partner and I changed our plans to come to Canada. He did not have a POE letter. Subsequently we have decided to give it another go and my partner got his POE letter. Unfortunately mine has expired as we had waited longer than the year expiry date (with other things on my mind I had got confused and thought the expiry date was 2023 stupidly). We are now considering the common-in-law route as we have been in a relationship for 8 years and lived together for 3 years, also owning a property together. We are due to leave in July so I am going to submit my application this week. Do you think this is a viable option for us? He is counted as a skilled worker and I would be too I think if that counts. Any advice is very appreciated!! I’m so sorry to hear about why you were unable to activate your POE. I don’t think you’re stupid at all with mistaking the expiry date for 2023, it’s not clear if unfamiliar with what these dates mean. I’m not sure I completely understand which application you are looking to submit. Unless you have dual citizenship, the most straightforward move to do is go to Canada with your partner as a visitor and then after he has worked a skilled job (NOC 0, A or B) for while, you can apply for a common law work permit on the back of that. You cannot apply for this before going to Canada as you have to wait until your partner has received a minimum of 3 payslips. After that, you need to take these with a letter from his employer and proof of your common law status and then go to the border for flagpole for the open work permit. You will need to provide the police checks for this application too. However, as long as you haven’t been BACK to Ireland (or the origin country of any other police cert you applied for) since you received your police checks, you won’t need to apply for brand new certificates. How many days exactly do they consider as six months, 180? I spent 183 days (185 if you count the day of departure too) in New Zealand the past years, which is approximately 6 months. Would you recommend getting a police check for New Zealand if I get an invite to apply? Hi Leonie, I think it’s 180 days, yes. I would get a NZ one, especially since it’s free anyway. Thanks! Do you know what would happen if I accept the invitation to apply, but in the end decide not to finish the application (so drop out of it)? Would I be able to get back into the pool or would I never be able again to apply for the WHV? I cannot find information about this on the official website, only about declining an invitation. If you do not finish the application (and hence do not receive your POE), you can apply again. If you receive your POE however (final acceptance), this is considered participation even if you do not go to Canada. In this case, you wouldn’t be able to apply again unless you have another citizenship. Do you know if I have to legalize (or get an apostille) for my police checks before I send them in during my application? I know that you need to send in certified translations if the language is not English or French, but I cannot find any information on the Immigration Canada website about legalization of these documents. Forget my question – thanks to the comments below I just discovered that you don’t need a police certificate anymore if you stayed in a countries for shorter than a consecutive period of 6 months. And my two stays in NZ are a cumulative 6 months. What a relief! Thanks for the info, it was really helpful. Do you know how likely you are to receive a POE once you accept an invitation? I am waiting on a family member in Canada to see if they could provide accommodation for me next year but if they can’t, I don’t want to use up my POE (and may apply in the future instead). I luckily received an ITA but as long as my criminal records are clean and my documents are valid does that normally grant a POE? Would really likely to know ASAP before the 10 day limit runs out! As long as you submit the correcr documents and don’t have a criminal record, there is no reason why your POE wouldn’t be approved. Thanks so much for the reply. I will definitely be visiting your site often! Your website is a GOLDMINE! Thank you! Still have a couple of question though… I’m in Canada on a Work and Holiday (I’m from Sweden if that matters), and plan to apply for a Yong Professional-visa when my WH expires. I arrived in August 2017, so my WH visa expires in August 2018. WHEN should I start the application process for YP? Can I start it now, or is that just unnecessary? I have a full time job in Canada already, but I have read somewhere that in the application for Young Professional, you should say NO when asked if you have a job offer or not. Is this correct? Seems a bit weird to me. Glad you found the site Stella! I would organise your YP work permit whenever you like. For Sweden, there doesn’t seem to be requirement to leave a gap between IECs so there’s no issue with a ‘waiting period’ or anything like that. For Young Professionals you MUST ‘a signed letter of offer or a signed contract of employment (up to 12 months)’ before even submitting a profile to the pool. For the Working Holiday program I recommend people to say ‘no’ to the employment question since CIC will then ask for employment details in the second stage and then the final work permit may be limited to one employer. For YP, you must supply this info since it is a closed work permit, limited to just one employer. This is a really helpful site – thanks so much! I have my POE letter and it states a date (in April) I need to enter Canada by to obtain my work permit. I have a few long term work commitments and would really like to see them through to the end, so ideally I would like to leave my employment in the UK later in the year – I’m thinking August or September. By this point my POE letter will have expired. I’m wondering if I can go to Canada to validate/obtain my work permit in April (say a weekend trip) but return to the UK for a 3-4 months, before coming back to Canada. I appreciate this will eat into my 2 year work visa term, but I’d rather have a reduced term visa than no visa at all. Do you know of anyone who has done this? Do you foresee any obstacles? Thanks for this, Gemma – you’re an invaluable source of information! I may need a little guidance on staying in Quebec! It’s very hard to explain IEC, work permit, working holiday etc. to any employer here in Quebec. They expect me to already have my permanent residency or citizenship and do NOT understand what a work permit is and why I don’t have my PR. I’ve been here for 4 months, I speak fluent french and I have a Masters. I understand that Quebec is supposedly “different” than the other provinces, but in term of getting PR for Canada, I hear it’s easier to find work as a bilingual in Toronto/Ottawa. Also, since I’m from the USA, I don’t get the automatic 2 year work permit. I only get one year and have to renew for the 2nd year..should I go ahead and apply early before my first work permit expires this summer. Thanks. I’m sorry to hear that you’re having what seems like a difficult experience in Quebec. I know a few people personally who have spent their working holidays in Quebec but haven’t heard of these issues before. Quebec is most certainly different (people on work permits are not eligible for provincial healthcare for one) yet I’m still surprised that you’re having trouble with people not understanding what a work permit is. Definitely a bit strange! I’m not 100% on how the IEC works with the USA (since you have to apply via a recognized organisation) but I would apply as soon as possible. If it’s just the same as the regular IEC program, then you have 12 months to enter and activate the permit anyway. I would like to ask regarding the IEC visa. I have applied for it and I am waiting for the POE letter. However, I am in the process to change my first name and that takes some time from the municipality. I want to ask if I have a POE letter with my old name (but same last name) and two passports (the old one and the new one) I will face any problem entering the country. Hmmmm…this is a tricky one. In this situation, I would actually contact IRCC (via https://secure.cic.gc.ca/enquiries-renseignements/canada-case-cas-eng.aspx) before you leave and ask whether they can update your work permit. They may just reply saying this is not needed but I think it would be worth seeing if they could. Otherwise, I’d bring all your documentation (including proof of name change) to the border with you. Hi there. Love your website, very helpful. Just a query about the eTA on the POE. I keep reading everywhere that an eTA will be on my passport automatically as I have received a POE. There is also an eTA number and expiry date on my POE. However when I put the details through the ‘Check your eTA status’ tool, it comes up with no matches. Do you know if that’s the case for all eTA’s obtained through a work permit or a mistake? My old eTA for when I visited a few years ago which should still be valid has also been cancelled, according to the ‘Check your eTA status’ tool. I’m glad you’ve found the site helpful Owen! Yes, this is a common technical issue with IECs and eTas. As long as you don’t change your passport before going to Canada, your eTa that you received with your POE is valid. Be sure to take a copy of page 2 (in addition to page 1) of your POE with you to the airport when flying to Canada. I didn’t want to apply for a separate eTA just in case it mattered that the new number wouldn’t match with the eTA on the POE. But if it’s just a technical issue then that’s great. And I’m assuming my old eTA has been cancelled as they issued a new one with the POE? Again many thanks, will be visiting your website several times again before I go! Could I send a request for invitation twice if I hadn’t declined the 1st invite and I let to expire my 20 days to upload all the documents ??? I did not click on the yellow “Withdraw profile” button and I requested again for IEC on 3rd January 2018. I used my old profile an I have been accepted again to the International Experience Canada pool(s) of candidates on 04th January and received a new application number. How long after have you received the invite to apply and upload all the documents ?? Where can I check how many places are available (openings) in the pool ? Hi there! You saved me with to the Police Certificate info. That tweet clarifies all!!! I’m applying to IEC-Working Holiday for the second time and I already submitted my documents. I was recently very nervous about the “accumulative time” spent on a country because within the past years I spent a lot of time traveling in Thailand as a tourist and I was worried that I may be needed to submit a Thai Police Certificate (which seems a long and complicated process on its own) but now I feel super relieved. I wish the distinction for IE regard to Police Checks were also specified on their website, tho. Thank you so much, guys! Love you!! I’m glad the info helped you Marcela! They have tweeted elsewhere that the website will be updated at some point. which twit are you speaking she saved you ?? 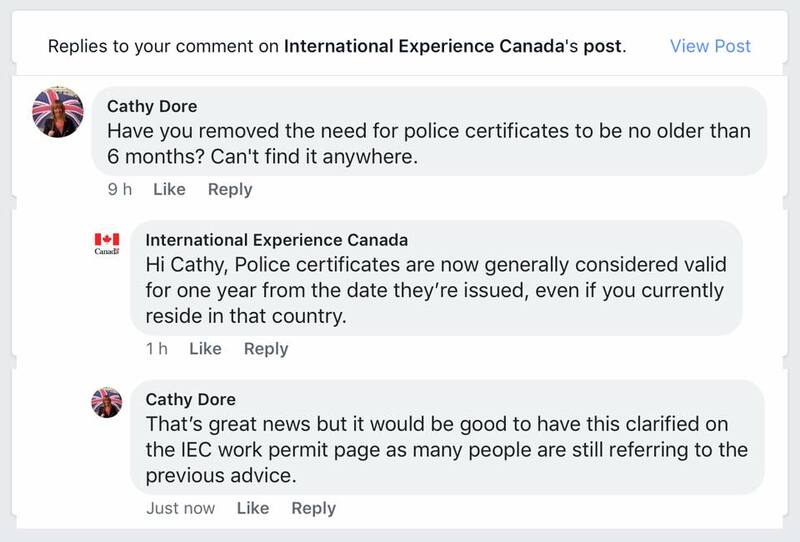 Marcela is referring to the recent update from the IEC team (via their Twitter) that they no longer require police certificates for people who have spent 6 or more months in a country cumulatively i.e. added up over different trips. You are only required to get police certificate if you have spent 6 or more months in a country in one go. So, if you travelled in the USA for 6 months or more (e.g. May 2017 to November 2017) then you would need a FBI police cert. If you travelled June 2016 – September 2016 and then February 2017 to May 2017 (for example), then you would not need one. My name is Kieran, I am a British citizen (currently 17 years of age). I’ll be 18 in April which is when I will apply for the IEC. My partner lives in Vancouver. When I eventually arrive I’ll be living with her and her parents for the duration of my stay. I was wondering what my options are to stay in Canada as I am determined to not go back to the UK. If it helps to know, I will be going into the beauty industry. I would very much appreciate your opinions on what the best option for me to stay is. Thank you so much. I’d keep in mind that Permanent Residency is quite a commitment considering it will cost you around $2k and around a year to process (more or less, it depends on the route). The common law/spousal route shouldn’t be underestimated either, as it involves your Canadian sponsor being financially responsible for you for a number of years after you receive PR. The only way to stay in Canada besides PR is to get job sponsorship but this is difficult and involves a $1000 for the employer and they have to prove that no Canadian is able and willing to do the job. I am resident in Italy but I am traveling since November 2016, 3 months in USA (November 2016-Feb 2017), 5 months in Mexico (Feb 2017-June 2017), 3 months in USA (June 2017- September 2017), 2 months in Italy (September 2017-November 2017) and I am living again in Usa since November 2017. Mailing address\” is where I am currently living and \”Residential address\” is where is my place of residence ?? In the line \”Residential address\” I have to fill out my home address in Italy or my american address where I am currently living since November 2017 ? Mailing address has to be Italy since you are applying for the Italian program and Italians must have a permanent mailing address in Italy. The residential address is where you are currently physically living so this would be the US address. I’m about to book my flight to Canada. My POE letter states I must enter by 2018/04/27. I was planning to fly (and arrive) on 2018/04/25. Do you think it it OK to arrive so close to the cut off date? I have Australian and British Passport. I have already been on IEC on my Australian passport. Am I able to apply for a new IEC permit on my British passport? Hi, guys! I’m in need of some advice. As a second-year applicant, I’ve been asked to fill the form imm5257b_1 in order to detail my whereabouts since the year 2000 (yes, 17 years and I was still in high school) and the past years I’ve traveled a lot. The form contains a table element in which you can add rows to add more data but in my case, I reached the maximum possible for the document and I still have some places to add. Since it’s a secured pdf I cannot add more pages because when completed I need to validate it in order to get a barcode on the last page and there’s no extra field to upload an explanatory letter for this document so I don’t know what to do. I’ve searched around and I haven’t found any answer to this and I also ask on Tweeter to IEC but no reply yet. I have 7 days to send this doc. 1. Just skip some places in order to fit all the info without showing gaps (it can’t show gaps). 2. I don’t know how relevant is to get the barcode, because the easiest thing will be just printed out, fill it by hand and then send the scanned version of the document in order to be able to add an extra page. Have you known of any similar situation? I’ll appreciate your feedback on this. You will need to provide ALL relevant info with absolutely no gaps. The reason you have been asked to complete this form is because your submitted resume had gaps. This has been happening a lot this year. You could either do option 2 OR combine this pdf with a separate word doc of your own explaining the rest of the info. Hi there, would like to know if you can help me out. I have applied for a working/holiday visa about two weeks ago and still haven\’t got an answer yet. I am interested to know if coming over to Canada and receive the visa in the country itself is possible? Hi Lee, have you received an invite yet or are you just in the pool? And what is your country of citizenship? Your site great. I was wondering if you would be able to help me. I have an Irish working visa which is expiring in June. Unfortunately unforseen circumstances stopped me from coming out to Canada to use the visa. I did activate visa. When I activated the visa, the officer said the Irish can apply for 3rd year. My question is do you the number I could ring iec? Would I be able to apply again due not being able to use visa and how could get third year? But there is one big question on which I do not seem to get any answers. Not on the website and not through the question-webform of CIC immigration, refugees and citizenship. – I wrote a letter of explanation + receipts etc. for the police certificate, because I did not receive that in time to fulfill my application. – Then I got the request to upload the document, but they asked me to fill in things that did not apply to the Police Certificate Document like ‘expiry date’, ‘document name’ and ‘document number’. And I could not fill in N/A. – Now one week later I did receive my ‘Correspondence letter’ already. Isn’t that weird? Do you have any idea how this is possible? Do you think I still need to upload the Police certificate? Or just bring it when I arrive in Canada? P.s. I have asked for an E-reader for my birthday so I can read your Ebook while traveling haha. It’s not uncommon for people to receive their POE (final acceptance, this is the Correspondence Letter you would have received) without submitting police certificates. It just happens sometimes, often because CIC know that certain police certificates take a long time to process. So congratulations! No, you won’t need to submit your police certificate if you have already received your POE. I would bring it with you when you go to Canada though as it is a useful thing to have. CIC also recommend bringing all application documents with you anyway when activating your work permit. The reply button does not seem to work. So hereby thanks for your response! Makes things clear now and I can be extra happy everything worked out. I will take all documents that I provided when I go to Canada, just to be sure. Good to hear things are going well for you in Montreal? Am I right in thinking the major difference is that as an American you have to apply through a RO? Besides that, almost the same? Things are going great! Yes, you are correct you have to go through an RO, but otherwise the process is the exact same,. I used InterExchange and was very happy with the service. Do you have any advice on getting a second Working Holiday Visa? Nice to hear! I believe for the second (as Americans are eligible for 2 x 1 year), you just go through the process again with an RO. IEC visa can be extended if got a closed work permit from any employer ? or I have to leave the country and re-enter it again after 23 months? I am currently applying for my IEC from NZ. Only question I have is, I am backpacking from Peru up to California before I move to Canada. There is no set date as to when I will be flying from California to Canada as we have no time restriction. When I submit my proof of travel documents, would it be acceptable to put in my flight from here (AKL, NZ) to PERU and then write in the letter of explanation the plans? or will this not suffice. Also, will I be charged when I click the apply button or are you charged upon acception? You will be charged the fees on submission of the work permit (after receiving an invite, before final approval). If I’m applying through a Recognized Organization (since my country, Argentina, doesn’t have an agreement with Canada), will I receive an invitation for sure? since I’m paying to this organization and Canada gives them every year a certain amount of vacancies. Or it will be also a matter of luck? If your country does not have a regular IEC program and you HAVE to go through a Recognized Organisation, I believe there are enough places for however many applicants the RO receives. This is just to the best of my knowledge though, I do not have much experience with ROs. -What do I have to include in my letter of explanation? -I lived in the US for more than 6 months and would need to submit a criminal record but they haven’t asked me for it, I mean is not in my supporting documents. Isn’t it weird? 1) Nothing, if you do not have anything to explain. If it won’t let you submit without submitting a Letter of Explanation, just upload a document and then delete it and that should fix it. 2) As soon as CIC see that you lived in the US for more than six months (they will know this from your resume), they are very likely to request a FBI check. It is not weird because they do not know the details of your background at this stage. Your website is a wealth of information! I’m hoping you can provide me some advice too. Both me and my wife are New Zealand citizens looking at applying for the working holiday visa. Only catch is that we have 2 kids (3yo & 2 mo). 1. Can I apply for a PR while on my working holiday visa? This is based on my work experience (IT) and also if I manage to find a job in my related field. How long does this usually take to process? 2. Preschool/daycare costs? Do you know approximately how much this would cost? Thanks in advance! Any help with this would be appreciated. Glad you’re finding useful content! Do you need a police check from your country of citizenship? I’m Italian but have lived in a few countries for more than 6 months so have applied for those police checks.. but do I need one from Italy? Yes, you will need one from Italy if you have lived there for over six months since the age of 18. I’m doing my cv but I have a problem, I only worked in the shop’s family and sometimes I gave private lessons of desing and autocard so I dont know if I can include it or I can’t because I wasn’t registred. What is most important about the resume is that there are no gaps – CIC want to know where you were and whether you were working/studying etc. The detail of precisely what you were doing seems to be less important since the IEC is not based on your skills and education. Me and my fiancé both applied for working holiday visas in January, he got his invitation within about a month but I haven’t had one yet. I’m aware it’s a random process and this can happen but wondering if you know what the likelihood is of me getting one at all? Or if there are any other ways I can get out there with him! We were hoping to go out in October/November time! It’s not a process that is explained super well on the CIC process but the general recommendations I have heard is three payslips. Also advised to get a letter from their employer explaining their role and hours, plus proof of your relationship (tenancy agreement, shared bank account etc) and then take all of this to the border to get the open work permit issued on the spot (this is called flagpoling, I have a post on it). I’ve never done this myself so this is all based on other people’s experiences doing so. I believe there is a paper application as an alternative but takes longer to process. Hi Gemma! Thanks for all of the awesome help here. My boyfriend is in the IEC process and just got a deferral because he needed to do an FBI Check in the USA. He was granted an extension until June 23, 2018. We just received the letter back from the FBI with his results, so we could theoretically upload it now to continue the process. However, we are wondering if it’s also possible to wait and upload in early June and if doing so would give him more time to enter the country and extend eligibility. He doesn’t plan to start in Canada until the summer at the earliest. Also he has turned 31 already, although he entered the pool before his 31st birthday, but we’re wondering if there are any extra age considerations here. We also are curious if he can travel to Canada just for a visit after he gets the POE but before he wants to “start the clock” on his year here. Or does it automatically start the timer when he next enters Canada? There are no age limitations beyond receiving an invite BEFORE turning the cut-off age. So since he has an invite, his age no longer matters. Great website and easy to follow. My husband and I are just getting ourselves organised for applying for working holiday. I am from Ireland and he is from New Zealand, we are living in Ireland currently and will be applying from here that is okay for a New Zealand applicant is that correct? Also from your tip on the resume we will have a 6month gap on it from travelling different countries so is it advisable to include this in the letter of explanation? Yep, absolutely fine for a New Zealand Citizen to apply from Ireland. You would definitely need to explain that six-month gap else you are very likely to receive a request to provide more information anyway. This will delay your application. Sorry if this has been answered in the comments, but I’m from England and have just had my invitation to apply. Do I need to obtain a police certificate straight away? Or is this only if I answered “yes” to the criminal record question (which I didn’t, my record is clean.) Trying to keep an eye on costs and it appears it’ll either be £45/£80 for a police certificate so I only want to do this if it’s completely necessary. Looking forward to your response, and loving your blog! I’m finding it very helpful! Glad you’ve found the blog helpful. Yes, you will need a police certificate for the UK if you have spent over 6 months there since the age of 18. You will need to submit this with the other documentation after accepting your invite. I’d go for the £45 one and if you need more time, just upload proof that you have applied. I have received my POE, but during the application process I believe I answered ‘Yes’ incorrectly to the question ‘do you plan to to a work placement or internship in Canada as part of your studies’. Nothing more was asked about it during the application, and I definitely answered no to the questions regarding if I have an offer of employment and if I was enrolled in an university. Is this something they could bring up at the border? Or now that I have my Poe I shouldn’t worry about it? I might do an internship but it wouldn’t related to my studies as I am not studying. Many thanks for your help on this great website. Congrats on receiving your POE! I honestly wouldn’t worry. If you did answer ‘yes’ to the work placement question, you would have later been asked for work details. Even if you did somehow ‘slip through the cracks,’ it is my understanding, the officers are the border have very little information about (or access to) your actual IEC application. My son has applied for IEC -RO. He received ITA and submitted his application for work permit. It has been 20 days now. He is planning to go in mid May. Do you think he will receive it in time? How long does it actually take? It says 8 weeks, is it always 8 weeks? And will he be getting stamp on his passport or he will get POE first and after landing at Canada he will get work permit? Is the IEC any different for IEC -RO ( Recognised organisation). Btw, we are from India. Just for information. If it changes anything. Thanks in advance and any guidance will be highly appreciated. I’m not super familiar with the RO process but I believe it is the same after receiving the invite. 8 weeks is the length of time the majority of the applications are processed in. Some applications are approved after a couple of days, some five weeks. It really does vary so much. Having said that, my personal experience is that most IEC work permit applications are processed within about 3/4 weeks. Your son will receive a POE first and then a physical work permit in Canada, as long as he has all the necessary paperwork (insurance, proof of funds etc). Thank you very much for the reply. If we have any other questions, will get back to you once we receive POE. It says he should have sufficient funds. Firstly , how much ? And second, should it be in his account or parent\\\’s account statement will suffice? He is 20 years old. I think you’d find the ‘Stage six: Receiving your POE’ section of this guide helpful. Proof of funds should be in his own bank account. As I understand his work permit stamp will be done once he lands in Canada. As he has to go to Edmonton, and there is less direct flight from India. So if he first lands at Toronto, the work permit stamp process will be done at Toronto. His connecting flight will be in 2 hours. Do you know how much time it generally takes at the airport? What is your advice for keeping the gap for the next flight? We are still awaiting the POE. Thank a lot for all the important information here. Good question! The time to activate in Toronto can vary so much but I’d generally recommend to leave at least 2-2.5 hours if your next flight is part of the same booking as the first. The reason I say this is because the airline will rebook you on the next flight (for free) if you miss the connection. If the domestic flight is a separate booking, I’d leave a longer gap, maybe 4 hours, as you don’t have that backup. Toronto Pearson can be very busy at times. Hi Gemma, I’m Australian and I’m 30 years old and I turn 31 in July this year. I applied for the IEC visa as I really want to experience living in Canada and I was invited to apply from the pool of applicants. I’ve applied within the 20 day time frame and submitted all required documents and the only remaining document I need to provide (as I got an email from the immigration office) is the FBI check as I lived in the US for 12 months back in 2012. I lodged this about a week ago and put tracking on it. It has been received by the FBI but could take a couple of weeks to process. I can’t seem to find a straight answer on this but I read that I have met the age requirements for this IEC visa as I’ve applied and been invited to apply from the pool before 31. I am just wondering if it needs to be approved before I turn 31 or if what I read about – as long as I was invited to apply from the pool and lodged my app before 31, that it would be fine age eligibilty wise. To meet age requirements, you must receive an invite before turning 31 (36 for some countries). After that, your age doesn’t matter. I got invited to apply for the IEC and I’m just filling out the form online. I happen to be in Canada at the moment (just as a tourist from the UK) so I have an eTA number, from when I flew in. On the online forms it asks if I have ever applied for an eTA – so I have put yes but when it asks for the eTA number it keeps rejecting it. It’s a 10 digit number beginning with J… I’m not sure what to do as I don’t want to leave any information out and ‘lie’ by saying I haven’t applied for an eTA but I’m not sure how to proceed if it won’t accept the number? If it won’t accept it, I would leave it empty and then upload a short Letter of Explanation that you already have an eTA and what the number is. hello, i am trying to apply for an IEC visa to work in canada as a snowboard instructor. I have had a job offer for the upcoming winter season but I cant apply for a visa because of my age! I am 17 but turn 18 in september before the job starts!! ay help with getting a visa??? May I pick your brain please. My husband and I would like to apply for working holiday for Canada from France. I saw that spots available for France are currently listed as zero. Do you think there are any chanses of getting selected ? Or do we have to wait for next year – apply in November December when there will be new opening ? I’m sorry, it’s not looking good for this season for you on the French program unless they add more places. They’ve done this for the UK program in June/July time the last few years, not sure about France. If not, you will need to wait until late autumn when the new season starts. I am from the UK and I have joined the IEC pool. What are my chances of being accepted as I have to go to a family wedding in canda in June. Could I go and stay there and wait it out for my acceptance? Also I read one of ur above questions. Did the application for ETA number because I completed missed that part. I just got back from Canada from a week stay and I had an ETA number then. Will this affect my application? With the UK pool being so oversubscribed, you may find it tricky to simply ‘wait it out’ in Canada. CIC did just add more places but it doesn’t change the fact that you may not receive an invite in this season’s pool. As I mention in this guide, I don’t recommend anyone to do this unless you are a member of a pool with lots of places and low demand and/or you are Australian (unlimited places). If you choose to fly to Canada on a one-way ticket, you may find yourself having difficulties with both the airline and when entering Canada. eTA-wise, there is no issue if you already have one. If/when your IEC application is approved, a new eTA will be issued to you. This will overwrite your current eTA. Also I received an email today stating your application has been updated but when I went to check no changes? Is this a system error? This is what is known as a ‘ghost email.’ It is common and doesn’t mean anything. Watch for an email about a message in your account, not an update. My son’s visa has been approved and they have asked for his passport which we have submitted. I was under the impression that he will get POE letter and the work permit thing will happen at Canada. Let’s see , once we get the passport back , we will come to know. I wanted to know about travel insurance. Is medical insurance and travel insurance same? Is it ok if we take issurance from ICICI LOMBARD Insurance? Is there an amount you can suggest for insurance for 3 months? I believe your son’s passport has been requested since he is from India and hence needs a visa to be able to travel to Canada. Most other IEC applicants are visa-exempt and just use the eTA that is issued along with their POE. The IEC work permit itself is not a visa – he will still probably get this issued on arrival in Canada like other applicants. My son’s visa stamp says, W1 Worker. Is this work permit? Any tips/ advice as he is leaving tomorrow. Wow, so soon! 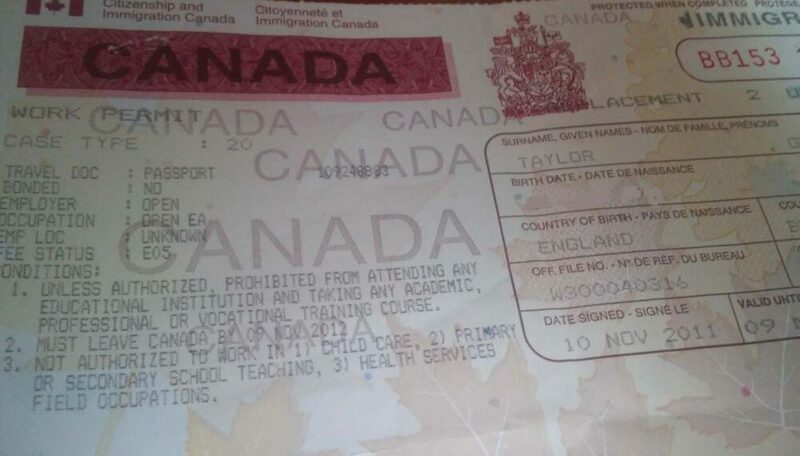 Work permits look a bit like this – https://offtracktravel.ca/wp-content/uploads/2017/04/iec-work-permit-canada-working-holiday.jpg they are a document stapled into the passport rather than a stamp. My main piece of advice would be to make sure he double checks all the details on the work permit before he leaves the immigration desk. Most importantly, be sure that it states work location as ‘open’ and the expiry date is correct. I just applied for IEC working holiday scheme. I am an Irish citizen and wondering how long it normally takes to receive an ITA. I am currently in Canada working under student permit after finishing few professional courses. I need to stop working as soon as my student permit expires and would like to get more information about the IEC working holiday visa, and how long it takes to go through the process. It’s hard to say but, being Irish, you should get an invite soon. I would say in the next month or two. It can then take up to 8 weeks for the application to be processed after you have submitted your docs, but in practice, it is more like 3-4 weeks as an average. Thank you Gemma, I will be updating the blog as it goes. One question I have is: Can I apply for a working holiday visa (while I’m in New Zealand), and while it’s pending, fly to Canada on holiday for up to 6 months? I have my eTA approved for this. Obviously I wouldn’t be working during my holiday there. I mainly want to know If I’m allowed to be in Canada on holiday whilst my working holiday visa application is pending? I understand that if it’s still in process then I’ll have to leave Canada before the 6 months is up. Yes, you can as per http://www.cic.gc.ca/english/helpcentre/answer.asp?qnum=941&top=25 but be aware that you may have issues with your airline if you do not have a return flight. Airlines generally do not like taking visitors with a one-way ticket to Canada due to the risk of the visitor being refused and then they have to fly you home! Do you know if I can change this somewhere? Will this be a reason to disregard my application? I am really worried and hope you have an idea. Thank you very much in advance and I wish you a lovely evening! Depending on where you are from, it may make a difference – some countries (such as Sweden) have a permanent residence requirement. Either way, you should upload a Letter of Explanation with your accurate address. This way, you should be fine. I have been trawling for an answer to this question everywhere including contacting Canadian immigration, who haven’t really answered my question at all. Basically I travelled to Canada last October (UK participant) planning to work 1 winter season and then move on. Because I only planned to stay in the country on IEC for 7 months this was the amount of time I purchased my health insurance for, resulting in my visa being granted only for 7 months instead of the full 2 year entitlement. It says on the website that the IEC visa can be extended under certain circumstances but not if the reason was not having sufficient health insurance. I just wondered whether you can purchase extra cover to get the rest of the entitlement? Any information you have would be massively appreciated. I’m afraid the requirement is to have insurance to cover the full length of your intended stay on entry. If your work permit is shortened to the length of your insurance policy, there is no way to get an extension. I am in the process of applying for a work permit for Canada and your website is proving extremely helpful in the application process so thank you! I do have a question regarding police certificates however. I was under the impression that they were mandatory to submit but it was not listed as one of the supporting documents needed. Does this mean I need not apply for one or will there be a need for it later in the process or when I arrive in Canada? I have spent a total of 15 months (3 winter seasons) in Japan over the past few years. With none of those stays being 6 months or more at one time. Will I still need to provide a Police Certificate from Japan when I apply for my IEC? Is this because I am currently in the United States and not Australia and does it mean I will have to get my fingerprints taken and send them off? How long have you been in the US? If less than six months you shouldn’t need a FBI cert. It seems like a weird message to me. You could upload a letter explaining how long you have been in the US (if less than six months). My name is Ricardo I’m from Brazil and I’m living and working in Canada under whv my visa expires in next January. In order to keep working without leaving the country I’d like to reapply for whv one more time. Do I need a new Loa from one of the ROs? Considering that I already have a job, a place to stay, speak English I don’t need any further help. You will need to apply again through an RO. This is because Brazil is not a participating IEC country. I understand the pools have now closed until late November… I applied for the last set but didn’t receive an invite. To apply again would I have to withdraw my last application and make a new one when the pools open again?? I know my account and GCkey will still be valid but will i have to create a new IEC application?? Yes, you will need to apply for the IEC again. Good luck! 1. How long before my 36th birthday should I apply – I understand that there is a 8 week processing time but is that after you have received your letter of invitation? I would really like to apply as close to my birthday as possible..
2. Also, it is ok if I enter Canada for a only a week or two to activate my visa (before by POE expires), then go back to NZ, travel around other countries for a few months, then go back to Canada and start working from then – noting that my 23 months will start from the date of my first trip to Canada? Since you are from New Zealand and there is more places than demand, you do not need to rush to apply for the IEC. Having said that, I wouldn’t wait TOO long since you need to receive an invite BEFORE you turn 36. Sometimes things can take a little time, even for citizens of countries where you are basically guaranteed an invite. If you do not receive an invite before your 36th birthday, you will be removed from the pool and your chance is gone. At the latest, I would apply 2-3 months before your birthday, perhaps earlier. It would be terrible to miss this opportunity. CIC sometimes have technical issues that can stop the issue of invites. One year, the whole application process was closed for 6 weeks or so. Remember, once you have received your POE (final acceptance), you do have a year in which to travel to Canada to actually activate it, regardless of your age at the time. The 8 week processing time refers to the period after you have submitted all documents following an invite. Your age at this point wouldn’t matter. As mentioned above, you must receive an invite before your birthday to be eligible. It is perfectly fine to enter Canada to activate the POE shortly before expiry (I’d recommend at least a week before the POE expiry) and then leave to travel elsewhere. You must, however, have the $2500 proof of funds and 23 months of travel insurance to show on entry to get the full 23 month work permit. Do you think it possible for someone to get a working holiday visa without having finished high school ? Yes, absolutely! There are no educational requirements for the IEC program. Hello Gemma, thank you for the insightful blog with Q&A you have setup! I am about to start my IEC working holiday application when they open probably next week. I would super-appreciate some insight/help on my issue as I really haven’t found an answer to my question! As I’m in a common-law relationship and intend to declare that on my IEC application, my partner would like apply for an OWP when and if I get an NOC A or B job. Will proof of my common-law status (i.e forms, rental agreements, explanations, letters, etc.) be required on my IEC application OR will that be on my Partner’s later OWP application? How do we approach this? Thank you very-very much in advance! You will need common law evidence later, when you apply for the work permit in Canada. Thanks for all the information, extremely useful! Do you happen to know how long is a police certificate good for? I have a couple of old ones translated and certified and I am wondering if I should get some new ones? You stated in the FAQ section that you may apply for the IEC from within Canada, my question is do you have to leave Canada and re-enter to show POE and other documents to a border/immigration officer or is there a way you can do that also from within Canada? Unfortunately, there is no way to activate your POE within Canada. I haven’t heard of this before. Did you sign into MyCIC and check that your application is still valid? Thank you for your prompt response Gemma! Yes I did check my application, it was withdrawn and I have no clue who did it.. So I applied again and I am back in the pool waiting for a response. Weird!! That is so strange!! I hope it doesn’t happen again. I am from Italy and I am currently visiting in Canada, I would like to apply for IEC2019, do I have to go back to Italy to get my Biometrics done? Or I can get them done here in Canada and submit my application from here? Thank you so much fro your time! Thanks so much for all the information you’ve already provided. I couldn’t see my question previously mentioned, so hopefully I’m not asking something that’s already been covered. I’m an Australian citizen, completed an IEC 2 year Working Holiday visa at the start of this year. Can I apply for an IEC – Young Professionals visa assuming I meet all of the requirements? Or are Australians only entitled to 1 IEC 2 year visa? Seems to be some conflicting information on the web. thank you for the great information you put here,very easy to read etc…. i have question if you can help me…is possible in this 1 year i will be in canada to start procedure for the provisional nominee programme so i get the permanent residency before the year finish?..i have see in some provinces they look people in hotel hospitality jobs that is also where i am working,as in most provinces it says is enought you to working 6 months in canada so you can apply…you think is possible to sort out everything in the 1 year i will be there? It could be possible, depending on the province’s permanent residency program and how soon you get the qualifying skilled job in Canada. I’m just applying for my second visa through IEC, this time Young Professionals. On my working holiday visa I stayed in Canada for more than 6 months, so I now need a Canadian criminal record check. I found one company that does a name-based check rather than a fingerprint one, which is a lot cheaper. Will this be accepted by IEC? Or is it essential to get a fingerprint check? New Zealand (where I also need a check) only does name-based, so I don’t see why it would be an issue, but I’d like to be sure! Hi Moana! As per the ‘frequently asked questions’ section of this guide – “I am currently in Canada or have lived in Canada before – do I need a Canadian police certificate?” “Not unless specifically asked by CIC.” Canada does their own checks, if they want one from you for further verification, they will specifically ask. For reference, if they do ask, then scroll down further in this section to the answer of “I have previously lived in Canada. CIC have now requested a RCMP criminal records check. How do I get this?” Yes, fingerprints are an essential part of this police check. Awesome guide ! I am having lots of trouble with applying for a working holiday visa. I submitted an application into the wrong pool at the end of last season (2018), I wasn’t aware of the difference between the young professionals and the working holiday. On the website it says that applications are withdrawn when a season ends but now that the new season has started I have tried applying for a new working holiday visa and it says “application valid, application already in the pools so it cannot be submitted.” I have already emailed the web forum multiple times and they just keep spitting out information from the website that says I need to press the “withdraw” button that isn’t there. Any help with this would be greatly appreciated! Secondly I haven’t been able to open the family information form IMM5707, is that my computer? I have updated my software and that still doesn’t seem to be working. Hi Gemma, I have a question about the working holiday visa for the Netherlands, according to the website from the government of Canada the first rounds of invitations still haven’t started yet. Is it normal that it takes this long? Another question , I’m ofcourse not sure if I will receive an invitation to apply for a working visa but can I still go visit my friends in March if I haven’t heard anything yet? If I don’t get invited to apply for the working holiday visa, I want to apply to university’s in Canada so I can go to school there again and while I’m visiting my friends I want to go to some university’s to check them out. Last year I already had a studenvisa which expired in nov 2018, I was in Canada for 8 months(I can’t apply for a working permit for the 8 months because the course I followed does not apply for this), I don’t want any troubles with the canadian government so I don’t want to take any risks in going back while I already applied for the working holiday visa. I have heard (not official) that the Dutch round of invites may be delayed due to Canada and the Netherlands confirming their reciprocal youth mobility agreement. It is unusual but there are some other countries that have also not started invite rounds yet. So the Netherlands is not the only one. Yes, you should be fine to visit Canada while waiting. Hi GEMMA. I am writing yo since I would like to apply for a WHV, and actually I am not a resident of the country I hold the passport (I am living in another country). When I entered to the canadian wesite, it sayd MUST BE A RESIDENCE OF ITALY AT THE TIME OF APPLICATION. Do you know if its possible to still be accepted ? You will need to enter a permanent residency address in Italy to be considered eligible for the Italian pool. Do you have a family member or friend’s address you could use? I just found your website and it helps a lot! Makes me have some hope so that you can actually start with an IEC work & holiday visa and end up with the Canadian citizenship! I have already received an invitation to apply but there is the question „Have you ever been refused a visa or permit, denied entry to, or ordered to leave Canada or any other country/territory?. Does this mean if I have ever been refused a visa APPLICATION? Since my visa application for IEC last year got refused. Or does it mean that if I already had the work permit (visa) issued and I wanted to get into Canada and then it was denied entry to at the boarder?? Would really appreciate some help since I am not sure about that! Yes, I believe it means whether you have ever been refused a visa, including the application. Why was your last IEC application refused? I’ve been in Canada since last year March 2018 and have come in on an IEC Working Holiday. My working Holiday Visa is expiring this month, I have however been selected for the Young Professionals program. My workplace has done their application and paid the $230 compliance fee, and so have I. My application was sent in on the 4th of Feb, but I am going to assume I am not going to have it before the 15th of March (expiry). I was hoping to flagpole and come back on a visitors visa, then wait here until I have approval of my Young Professionals Visa to continue working. The reason I do not want to leave Canada is because going back to South Africa, I might need to do a medical for the second time. I have a car and am renting a place, so it would not make sense to go back. I am applying under Dutch Citizenship as I did before and there has never been a problem with Visa’s or ETA’s/ESTA’s. I’m not sure what your question is, but if it relates to what to do while waiting for your Young Professionals work permit, I would EXTEND your stay in Canada as a visitor online and NOT flagpole. Applying online to extend your stay as a visitor costs $100 but it is far more likely to be approved and then you won’t need to leave Canada. 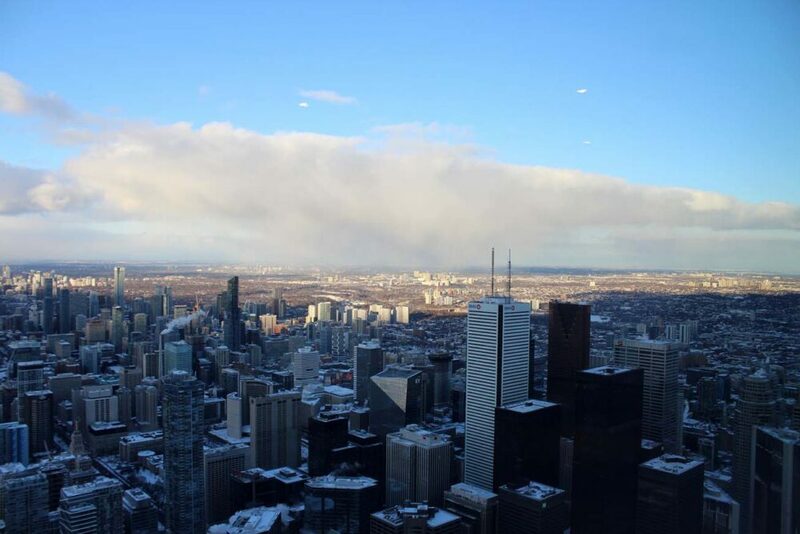 While you wait for the decision on the visitor status, you have implied visitor status and can stay within Canada. Thank you so much for the swift response, this whole thread has been helping me since I first started my journey! I am afraid it won’t be processed in time, but you mentioned I’ll have the implied visitor status as long as it is applied for? I’m scared I’ve left it for too late (my own fault) but at least I won’t get a record for being here without a permit? Would this be the place to go? Thanks again! Thank you for your site and all your information. I would like to ask regarding the IEC visa. I have applied for it and I am waiting for the POE letter. Once you receive your POE letter, I understand that you have a year to enter Canada. Due to the time it has taken to apply and now the concern about timings and work projects, I am not sure I will be able to leave in the year. My question is, are you able to defer the entrance? Is there anyway to enter the country later than your entry date? If you receive your POE and then can’t go within the year, I’m afraid you have lost your chance. Receiving a POE counts as your participation. In all the years I have been involved with the IEC, I’ve only ever seen four people receive extensions or deferrals on their POE entry. All had very serious reasons why they could not activate their IEC. From memory, one was hospitalised for most of the year and needed to stay in their home country to be observed for another year. In a really sad case, one participant’s parent died very close to their activation deadline and they had to care for their remaining parent. Extensions are only available in very serious situations and even then, it is not guaranteed. I have been granted a working holiday visa extension for 8 months beyond the expiration of my original visa(i have been in Canada for 2 years already), and am wondering if you have any insight on how many visa extensions you can get. I applied from in Canada with an employer specific extension until June 2021, but the extension I was granted is only until October 2019. Any advice if I can apply for another extension on top of an extension? IEC extensions can only be extended in very specific circumstances. This include scenarios such as participants changing their passports or the border officers making an expiry date mistake. There are no extensions that allow you to work longer beyond your original participation limit e.g. for UK and Australian citizens, this is two years maximum. If your situation is not listed on this page https://www.canada.ca/en/immigration-refugees-citizenship/services/work-canada/iec/extend-change.html, then you cannot extend your IEC. I should add that some of these scenarios are only applicable for people with Young Professional IEC permits, such as the ‘I want to change employers’ one. I just got my invitation to apply for the IEC today and so am trying to fill in as much information as I can at the moment. In the section ‘Immigration history and Citizenships’ it asks if I have ever applied for or obtained a visa, eTA or permit to visit, live, work or study in Canada? Was there such things as eTAs at the time?? Mandatory eTAs came in for Canada in November 2016. The program did technically start before that but it wasn’t required so you may not have had one. Ah ok thanks very much. I am Irish and I think I literally just showed up and got a stamp on entry at the time.. as far as my memory serves! I just have one more question: I am from Poland and want to take part in the Working Holiday program. I am still at University and going to graduate in June. What should I answer in the “Are you registered at a college or university in your country of citizenship?” Yes? or no – since soon I’ll be a graduate? What will happen if I choose Yes and get an invitation after I graduate? You should answer all questions honestly so that would be a yes. I believe all it will do is potentially offer you the option to apply for the ‘International Co-op’ program. You have to be a student to be eligible for that program so it’s just checking whether that is an option for you. Don’t worry though, if you want to do the working holiday program, the application for that will still appear too. I am currently working in Canada under the IEC and my working visa is set to expire in August of 2020. Due to a family member becoming very sick I need to go back to Australia, where I will need to renew my passport. Am i still able to come back to Canada to work using my current work visa if I have a new passport? So I looked at the site and i’m a little confused. Would i still need to apply to extend my work permit, even if my permit says it expires in 2020 and not when my passport expires? No, you wouldn’t need to. If you were in Canada, I would advise you to go to the border to get a new work permit issued. I’ve heard about people being successful doing this where their work permit has been issued similarly incorrectly, with the wrong expiry date for example. Since you’re not in Canada now, I would try and get it fixed when you next re-enter. Hi, this guide is great. Definitely one of the better more informative guides I’ve found. I have a question you might know the answer to (apologies if this has been asked and/or answered several times already) I have just received the invitation to apply for the IEC working holiday visa and I’m wondering – regarding explaining timeline gaps in employment etc is there a best way to do this as I have previously saved extensively in order to not have to work for an almost 2 year period where I lived on savings. I just wonder what way to best explain this gap in employment. Also when I initially finished college I have a gap before I started in a job. Hope you have the answers. Hi Jack! I wouldn’t worry too much about the nature of actually explaining it, it is making sure that there are no gaps that is so vitally important. They are not judging you by whatever you were doing during that time, they just want to know whether they need to require medicals, police certs etc from you. So you’d be fine to explain it as unemployment and put the location where you were for the most part. To give you an example of my own, I became a Canadian citizen last year and I had to detail my whereabouts in detail for the last 7 years, including addresses. For long periods of this time I was travelling and living in a van, which I’m sure the immigration staff assessing my application thought was bizarre! My IEC working holiday visa application was recently rejected because the submitted scan of my passport was not clear enough. I think there is grounds for dispute – my partner submitted a passport scan created by the same scanner and was accepted. Have you ever known anyone to successfully appeal a rejected decision for a WHV? Yes, I have, though I haven’t seen someone have to do it for this reason before. That is not to say that you won’t be successful as it does sound like you have a case. If you like, you can join my O Canada Facebook group and get more advice from people who managed it.